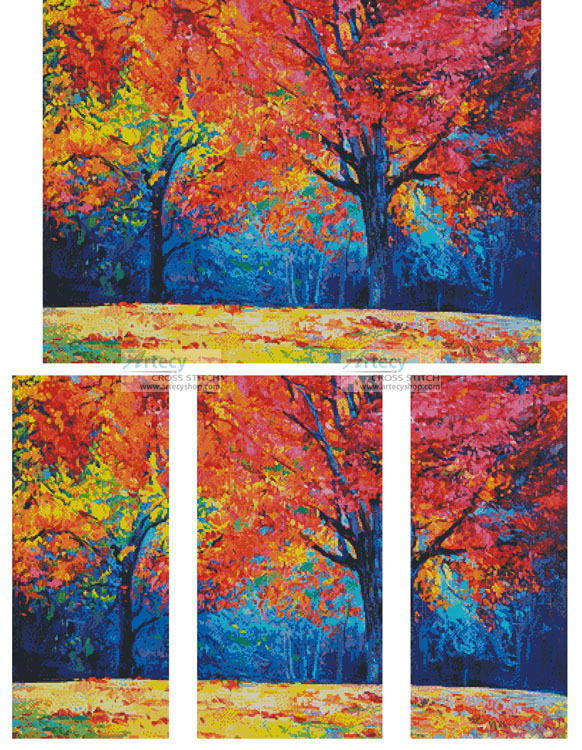 Autumn Landscape Abstract Cross Stitch Pattern to print online. This counted cross stitch pattern of a colourful Autumn Landscape was created from Artwork by Boyan Dimitrov. You can stitch this design as one picture or as a Triptych (3 panels). For the Triptych design please look at the top of the pattern for where to start and end each panel which has been marked for you. You could either stitch each panel on a piece of fabric separately and frame each one, although this can be expensive, or you could stitch the design as a Triptych on one piece of fabric. We have left a gap of 20 stitches between panels in the picture but you could add more or less of a gap between panels, whatever you prefer. If you do not like the fabric showing between panels you could then have a custom mat board made that will have the three panels showing through but will hide your stitches. We also offer a larger full version of this pattern which you can find here.